COMMENT & ANALYSIS: National and local action is needed to bring speed limits in Ireland in line with best international road safety practice, writes Cian Ginty. There’s a saying “somebody had to die” before things will change. This is sadly true in the case of six-year-old Jake Brennan who died in mother’s arms after being hit by a car outside his home in a Kilkenny housing estate. Jake’s mother, Roseann Brennan, has told of how some of her son’s last words were “I don’t want to die”. Since then, Roseann Brennan has been tirelessly campaigning for lower speed limits in residential areas, including a protest outside our parliament day and night for three days last week. Under the banner of ‘Jake’s Legacy’, she has also met a number of times with the minister for transport, she has done numerous media interviews, and campaigned on Facebook, with nearly 20,000 supporters (and more recently on Twitter). As the Jake’s Legacy’s campaign and others have highlighted — with few exceptions, local councils have failed to act on lowering speed limits in areas where people live, as well as areas of high activity of walking and cycling. 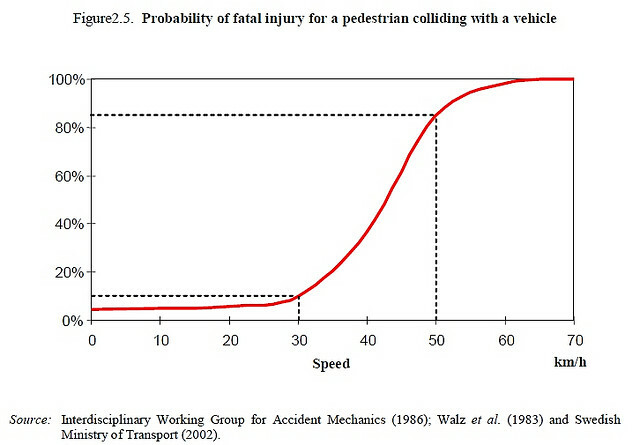 Lower limits such as 30km/h is a measure which has been proven to have notable safety benefit. There’s also health benefits, ranging from making walking and cycling easier to noise reduction. Worse still: As our towns and cities have expanded, many councils across the county have even failed to expand the default urban limit — leaving schools, housing estates and shops with 60km/h and 80km/h limits. Town, city and county councils have been left to their own devices for too long. There now needs to be stricter national guidelines. This kind of attitude would be mind boggling to experts in countries with more progressive speed limits such as the Netherlands, Germany, and France, where local councils are acting on their own. Yes, we need to look at the function and use of roads — but this is not an impossible task. Local input is central to the process, but so are revised mandatory guidelines with ranges of allowable limits. The current guidelines have problems ranging from not being prescriptive enough to being too restrictive in the way they allow 30km/h and 40km/h to be applied. There’s also no provision for 20km/h, which would suit smaller residential streets. The headline on the article by O’Donnell today reads: “Why ‘Jake’s law’ on speed limits is the fastest way to cut road death numbers”, however, the bulk of the article is spent explaining why we need to keep the status quo. From Dublin to Mayo, and elsewhere in the country, we have seen examples of council officials unwilling to act on speed limits, even outside schools and on small residential streets. But this isn’t just an urban issue. In one location relating to a rural school outside a village councillors were told that lower speed limits could only be considered when all other road safety issues have been dealt with on a school by school basis — this is not true, Dublin City has implemented timed 30km/h limits outside a number of schools without looking at other measures. In another case, officials are continuing to refused councillors’ requests for an 80km/h road to be reduced to 50km/h along a 1km stretch of road with with a national school, a play school and “21 entrance points on that stretch of road, with on average three houses accessing the road from each entrance”. But Dublin has its own problems: motorists using narrow streets — which can only be described as residential — as rat runs. In one on-going case where councillors have looked for action, they were told that the primary reason traffic calming measures are being ruled out for is because the 50km/h speed limit is not being exceeded on the short and narrow street. Councillors’ calls for lower limits on these streets have also amounted to nothing. The Department of Transport needs to stop treating 20km/h, 30km/h, and 40km/h as experimental limits which have only limit use. There is zero justification for further trials or studies. These limits have been used far too widely to be treated in such a way. The minister needs to put stricter guidelines, make more funding available over the next few years to allow for the changes, and then have legally-binding deadlines to fix limits. We need to stop taking the easy option. Speed limits should be applied according to conditions of roads, the surrounding environment and the activity on them — Are there many junctions and houses? Is it likely that many people will be walking or cycling? Do we want children playing on residentials streets and housing estates? The current setup of applying limits with a broad strokes (ie town boundaries or road type alone) is outdated. Even if it takes a few years, the change would be worthwhile. A good start would be to set a default urban speed limit of 30km/h and, as shown above, allow councils to work out which roads can — within the guidelines — have higher or lower speeds. Picking anything within the guidelines would be simple, while councils would have to spend time justifying keeping limits higher outside schools, in housing estates or town centre. We know that councils have not acted on using lower speed limits which have been available to them for years, and, as we reported recently, the Road Safety Authority failed to act on its 2010 plan for promoting lower speed limits. So, action now needs to be taken to force change — hopefully, with a bit of pressure from groups such as Jake’s Legacy, the Minister for Transport is up for the task. Funny showing a junction just around the corner from me. Marino pilot 30 kmh could be far more successful. Enforcement and awareness very lacking. Signage only on entrances to area with no reminder at circles t junctions. Traffic calming measures closed some roads, made one ways and widened footpaths. Cycle permeability not well catered for on one ways and closed off streets. There are still peak time rat runs through area mostly to avoid traffic signal controlled one way on Philipsburgh Avenue. Far more could be done to make 30 kmh work in Marino but nobody really seems interested in doing anything at all. Could do with Traffic calming in Stillorgan village, lanes of cars shoe horned into the road. No bike lanes at all. I think it’s a 50kph and don’t cars drive it when there are no cars around. This is a urban village but nearly distroyed by car congestion and speed. Also on Haverty Road in Marino which runs behind the Shops on Marino Mart it is one way for Motor Traffic but two way for Bicycles. But the locals just ignore this and use the Road as a shortcut and rat run so they dont have to use the Lights on junction of Malahide Road and Marino Mart. When you turn left at the CBS School beside Marino Mart then turn right onto Haverty Road there is three signs telling Motorists that they are barred from going up the Road and only allows Cyclists.But the majority of Motorists just ignore this and go up the Road. So there is blatant ignoring of the Traffic calming in the area. I had a row with a Motorist around two Months ago who sped pass me and nearly collided with a car coming down the Road.